Happy Sunday Everyone! My entry for this week’s Yummy Sunday is a breakfast which my hubby lovingly prepared for me. 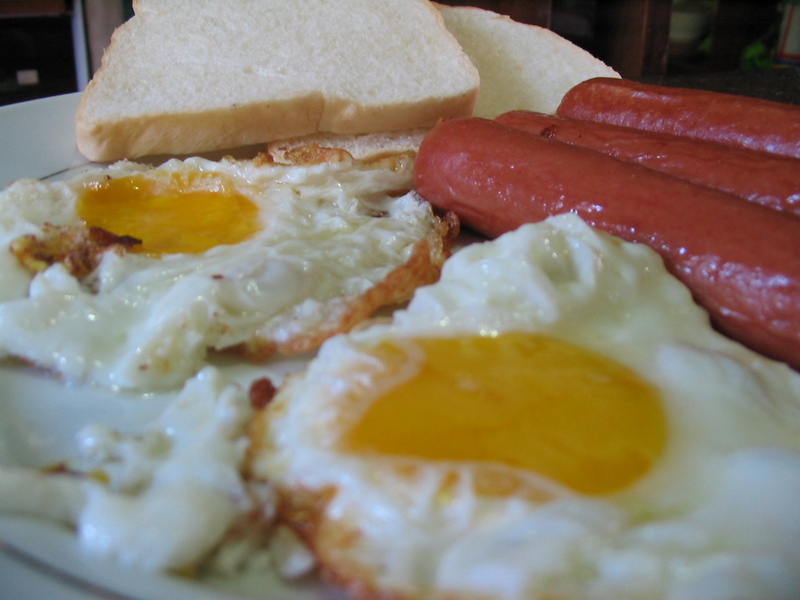 It’s sunny side up eggs and chicken hotdogs. When hubby is at home, he’s the one who prepares our meal. When he is not tired from work, I am very much happy because he will take my place in preparing dinner. Every time I ate the food he prepares for me, my heart is filled with joy thanking God for giving me a husband that loves to cook. How about you? What’s your YS entry for this week? Please don’t forget to leave you links on Mr. Linky so I can visit your posts. By the way, after you have added your links please vote for my cousin’s photo “JESU_D”. Hope you will help me support her. Thanks! My post is now up. I love sunny side up eggs with toasted bread! Hmmm… sarap, my kiddos like it. Delicious yan lalo na pag ang hubby ang nag prepare. My hubby is the one who prepare for our breakfast too lol! Happy ymmy Sunday my entry is up! check it out. salamat sa continued support ..heheh!! lami kaayo sa tanaw lang. lol! that’s a sweet and loving gesture from your hubby. looks delish! MY kids love eggs but not hotdogs..
Let’s eat some pizza at my kitchen..
PS.. sis sa kitchen blog kita inadd..
favorite ni ako mga boys. im once part of Yummy Sunday by PeterJanet but sadly it ended last Jun 27 thus it was my last entry. i jaz found out now that you became the new host and i would like to join again, this sunday (nov 15). sayang 🙁 if i only knew it earlier. anyways, see you on sunday.